At its meeting in Wausau today, the Wisconsin Natural Resources Board unanimously approved a statewide quota of 275 wolves for the next hunting season, up from the quota of 271 set last year for the state’s inaugural hunt. Although it’s the legislature not the board which sets related laws, that didn’t stop a number of wolf hunting opponents from lashing out at the state Department of Natural Resources. DNR Ecologist Bill Vander Zouwen later summarized the agency’s extensive, scientific method including eye-witness reports, radio collaring, and tracking the animals to determine population totals. He said the information comes from a number of staff members, volunteers, and federal officials who are involved in the process. Additionally Wisconsin, unlike many other states, does a wolf total every year. A number of conservation and hunting groups support the quota while calling for an increase in its number. With more than 800 wolves in the state and the DNR’s goal of 350, the groups testified the 275 quota falls far short of obtaining that. A number of those who are opposed to wolf hunting believe it’s okay to let farmers shoot wolves who are a danger to livestock. Melanie Weeburg says, however, very few wolves that are killed by hunters are near farms. She says a wolf harvest splits up the pack making it less likely for the predators to hunt large animals, thus prompting them to go after livestock. The approved plan would issue 2,750 permits but the DNR may have to reduce that number if the state’s Chippewa tribes decide to participate in the wolf harvest. 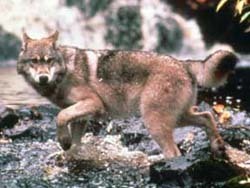 The Chippewa would be entitled to hunt up to 115 wolves. The tribes, who are staunch opponents of hunting wolves, chose not to kill any of the animals last year.